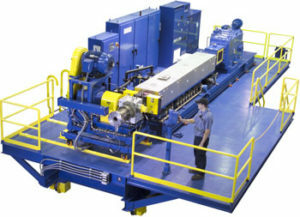 TEM Series Co-Rotating Intermeshing Twin Screw Extruders | NFM Welding Engineers, Inc.
TEM* Co-Rotating Intermeshing Twin-Screw technology continues to advance the possibilities of polymer processing. 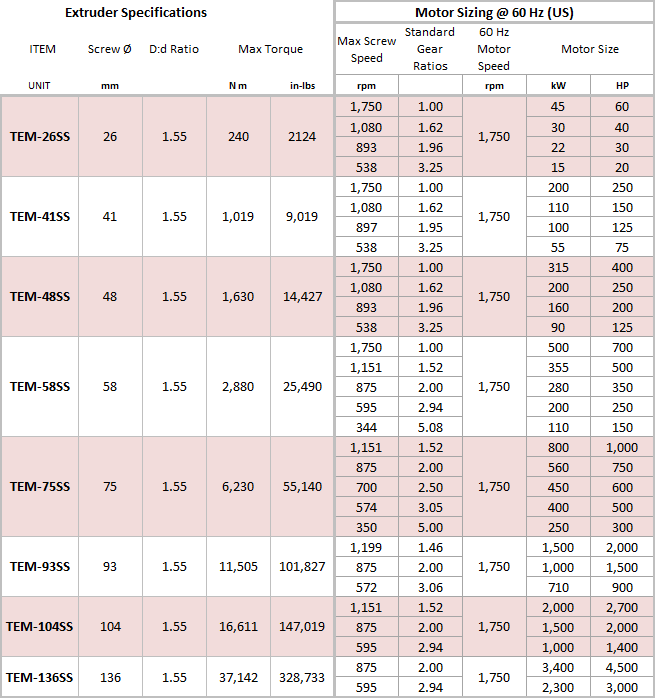 The TEM extruder models include designs for the industry standard 1.55 D/d ratio, as well as high volume models with ratios of 1.8. 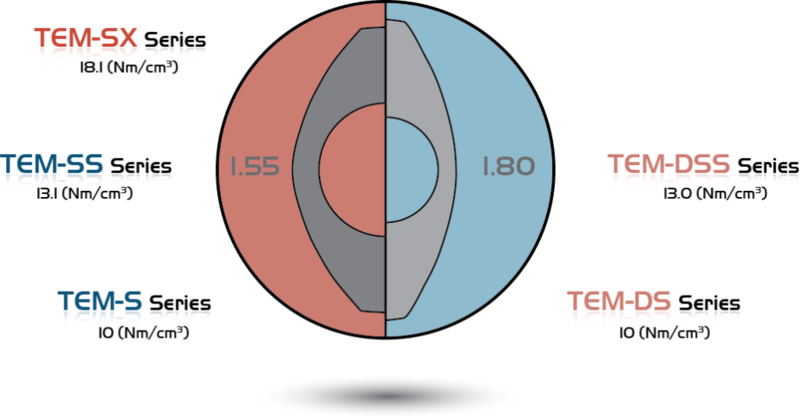 Both of these designs are available at various levels of torque capacities including the TEM-SX series providing the highest torque-per-free-volume available in the market. 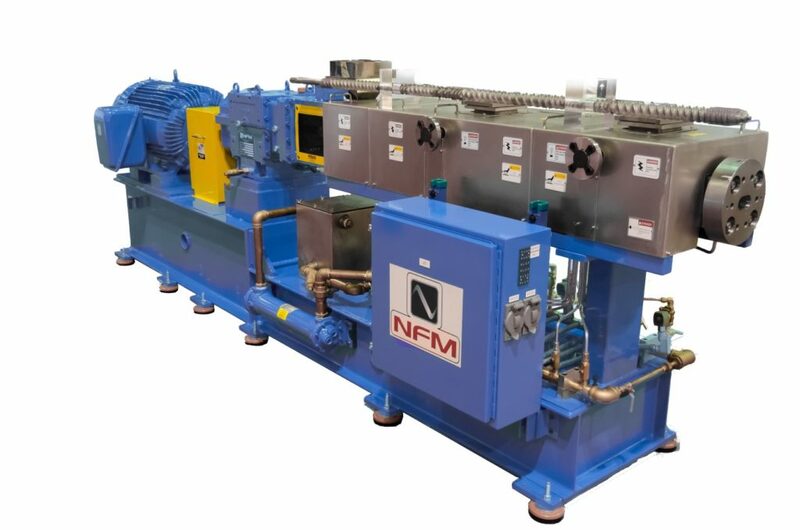 NFM has the capabilities to match you application with the ideal extruder design for optimal process performance and reliability. The TEM design offers the best in design flexibility and customization for optimal performance in practically any polymer extrusion application. Sizes range from 26mm lab extruders to 240mm diameter full-production lines all capable of being fully integrated into a turnkey extrusion processes. 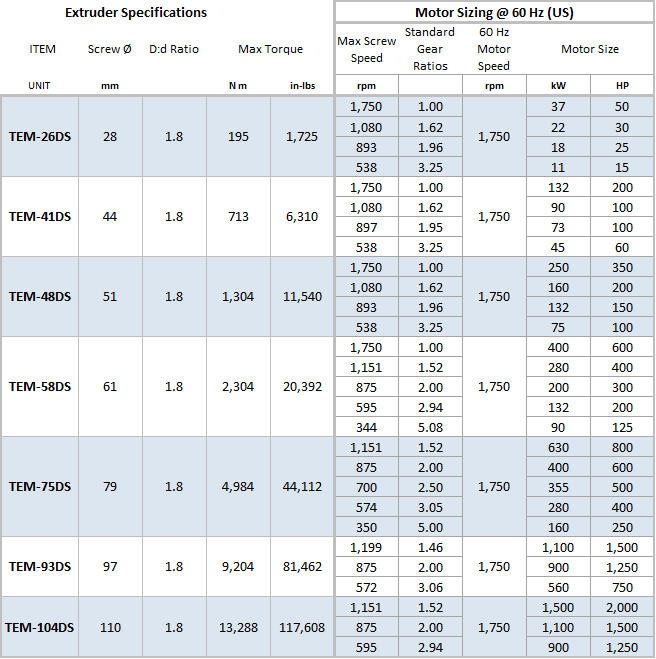 Explore the TEM Features and Specifications tabs to learn more about tailoring the TEM technology for your extrusion process.  NFM / Welding Engineers, Inc. has partnered with world leaders in gearbox design and precision craftsmanship. Gearboxes for the TEM Series extruders are designed for optimal splitting and transfer of the torque to both screw shafts. Gearboxes are designed with easily exchangeable reduction gear sets. Gearbox housings are designed for optimal thermal transfer and sound dampening. Helical Gears are manufactured from AISI 9310 steel and carburized to 58 – 60 RwC. All gears are certified for depth and hardness. Gear teeth are ground to very high quality level AGMA12 (DIN 4) ensuring incredibly quiet operation and greatest efficiency at high speeds. All gearboxes are provided with a distribution system for direct lube feed on bearings and gear teeth. Many options are available to optimize your gearbox lube system based on your thermal and oil filtration requirements. The TEM Series of extruders feature a standard 4:1 L/D barrel section, though shorter and longer barrels are available based on your process requirements. Standard designs include Feed, Closed, Vent, Injection, Side Feed, and De-watering (not shown above). Various inserts and ports are also available for optimal vent design, injection and instrumentation. Standard barrels are manufactured from mild carbon steel and HIP’d with bimetallic bore materials based on your material’s wear and corrosion resistance requirements. NFM offers a variety of barrel options including various base materials (tool steels, stainless steels, duplex, Inconel, etc. ), various bore materials (Nitrided, Stellites, Colmonoys, Carbides, etc.) and external treatments (nickel plating, chrome plating, etc.). Cooling: TEM barrels are cored for cooling medium transfer close to the barrel bores for optimal thermal transfer and precise temperature control. The barrel closed loop cooling system includes all manifold piping, copper plumbed supply & return lines (not flex hose), solenoid valves, check valves, centrifugal pump, motor, and reservoir. The entire unit is mounted on the extruder base. Heating: Electrical barrel heaters are used to maintain precise barrel temperatures. Controlled by thermocouple feeding back to the control system. Heater wattage and voltage are designed to suit the process and environment. Optimized to suit your formulation and process conditions. Standard high wear resistant screw elements made of mild carbon steel soft core creating ductility in the spline section with an outer 10V-420 HIP’d material (~55RwC ) for the process section. Other materials for different environments are available upon request. Manufactured from specialty high carbon remelt forged aircraft quality steel. Screw tips are are used to clamp and lock the screw elements in place. Conical tip designs are standard coming in a one or two-piece design. For temperature sensitive polymers various mixing tip designs can be utilized to generate turbulent tip flow which helps prevent polymer stagnation and burning at the screw tip. For further improved performance of temperature sensitive polymers, NFM offers proprietary designs which allow for cooling media to transfer down the screw shafts to the screw tips. Because the screw tip is where materials can see a sharp temperature rise and/or flow stagnation, these is often where polymer degradation can be severe. NFM’s screw tip cooling utilizes internal shaft tubing to transfer cooling media directly to the screw tip to help control melt temperatures. The cooling media can also be made to cool the screw shaft on the return flow. All NFM side feeders are mounted on robust support stands and are readily portable for storage when not in use. Side Feeders include an intermeshing twin screw design available in solid or segments screws. Screw and barrel metallurgy range from basic nitrided hardened to HIP’d bimetallic wear resistant materials. All side feeders are variable speed, integrated into the extruder PLC and sequenced for safety and proper start-up procedures. 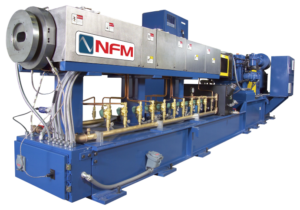 The HSF Series side feeders are NFM’s standard line of downstream side feeders with models available for every TEM extruder size. These high speed, high free volume feeders enable you to maximize processing throughput. This series of side feeders are used globally for downstream feeding of mineral fillers (talc, calcium carbonate, mica, fly-ash, wollastonite, etc. ), glass-fibers, chemical additives, etc. The DSF Series Side Feeders allow enhanced feeding of small micron talc, fumed silica, precipitated calcium carbonate and other low bulk density fillers. This technology utilizes adjustable levels of vacuum to pull air out of the material feed stream prior to entry into the extruder. NFM’s VVS Series can be mounted horizontally or vertically to prevent fouling of vent port openings. 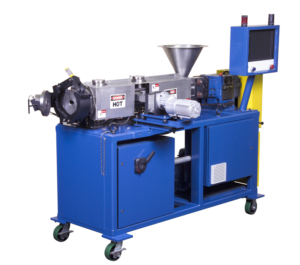 Learn more about NFM’s Side Feeder technology which can be retrofitted for any OEM extruder.